​Previously, I had done extensive research on the idea of optimum exposures, in terms of how long to expose for and how many to acquire for stacking. This led to the creation of my Optimum Exposures Calculator, which was meant to provide users with a good idea of exactly this. The mathematical framework used was not my own and all credit went to Steve Cannistra and Charles Anstey. There was however an underlying issue with the latter mathematical framework - some quantities were in ambiguous units and the final equation was dimensionally inconsistent. These were of course red flags to supporting the model proposed. The results one got from them however seemed somewhat sensible, given prior PixInsight analysis of a base image's noise level using the NoiseEvaluation script. I did find however that for low readout noise CCD sensors (e.g. 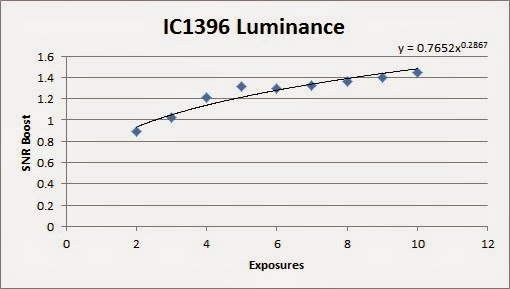 Sony ICX694), the calculation of total imaging time given by this model was not viable (recommending 1 exposure, for example). Additionally, it was based on the assumption that Signal-to-Noise Ratio (SNR) in an image increases as the square root of the number of exposures stacked. This assumption is good when it comes to an average combination technique, but not for more robust, statistically-weighted combination techniques such as Kappa-Sigma Clipping. Given that I have data on multiple objects that was captured with dithering, I thought I would use it as a test-bed for SNR improvements as I stack more and more raw images. Data from the M51 Whirlpool Galaxy, IC1396 Elephant Trunk Nebula, NGC6992 Eastern Veil Nebula and NGC6888 Crescent Nebula was used for this analysis (the former three in Luminance and the latter in Hydrogen-Alpha, captured with three different telescopes and two different CCD cameras). The method employed was as follows. For each object, a single image was calibrated using all the darks, bias and flats available for it (using Kappa-Sigma Clipping in DeepSkyStacker for all - light, dark, bias and flat frames). This image was then opened in PixInsight and the NoiseEvaluation script was ran over the entire image and the result multiplied by 65,535 to convert into ADU. Using the Statistics process, the Mean of the entire image was obtained. A ratio of these gave a good estimate for SNR in that single calibrated image. This process was repeated for stacks of 2 images, 3 images, 4 images, etc up to 30 images (depending on available number of raw images for target). The ratio of SNR between the single calibrated image and the stacks of calibrated images were tabulated. By carrying out this ratio of SNR, what we find is an SNR Boost Factor, which by virtue of division, is virtually independent of most factors and relates almost purely to the combination method employed - Kappa-Sigma Clipping. 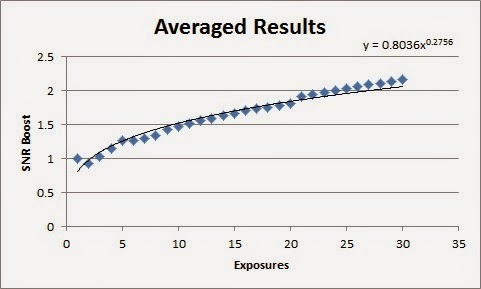 ​This graph is very important in my view because it provides empirical evidence toward the SNR boost of stacking images using Kappa-Sigma Clipping, a combination method that is strongly recommended when it comes to outlier rejection and prevention of consistent loss of random SNR (such as what Median produces). We note that from the above graph, we see that you need to stack 3 images in order to get the same SNR as a single image. This is consistent with other people's observations. Moreover, Kappa-Sigma Clipping being a statistically-weighted combination method, it strongly benefits from a lot of data points. As a result, stacking less than about 10 images does not provide as significant a benefit as can be potentially achieved. ​It is this equation that has now replaced Charles Anstey's mathematical model in the Optimum Exposures Calculator, currently dubbed version 2.2. The recommended value range for SNR Boost Factor is 1.5 to 2.5, depending on how far you are willing to take your imaging sessions of your target of choice. A further advantage of having used this empirically-derived model is that PixInsight is no longer required for analysis of the base images as the NoiseEvaluation script is not needed. Any software able to measure the Median of a small rectangle in an image suffices (for the background flux calculation) - MaxIm DL, ImageJ, PixInsight, etc. This should give the user an idea of really how high an SNR Boost Factor is desired (or even, needed). I spent a good deal of time thinking about the idea of CCD Full Well Capacity and how this would play a role in the optimum exposure time of single images. 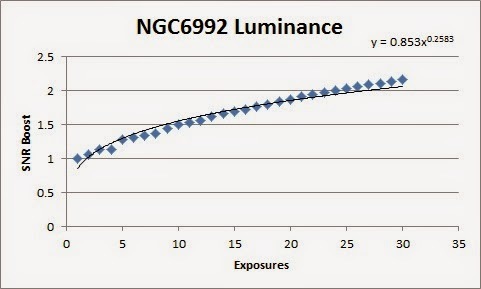 In general every CCD sensor has a finite Full Well Capacity for its pixels. This is the maximum number of electrons that fit inside each pixel before the signal there is fully saturated. Anti-blooming CCD sensors will drain electrons when this is reached in order to prevent electrons spilling over to adjacent pixels (which would cause ugly blooming over saturated regions such as stars). 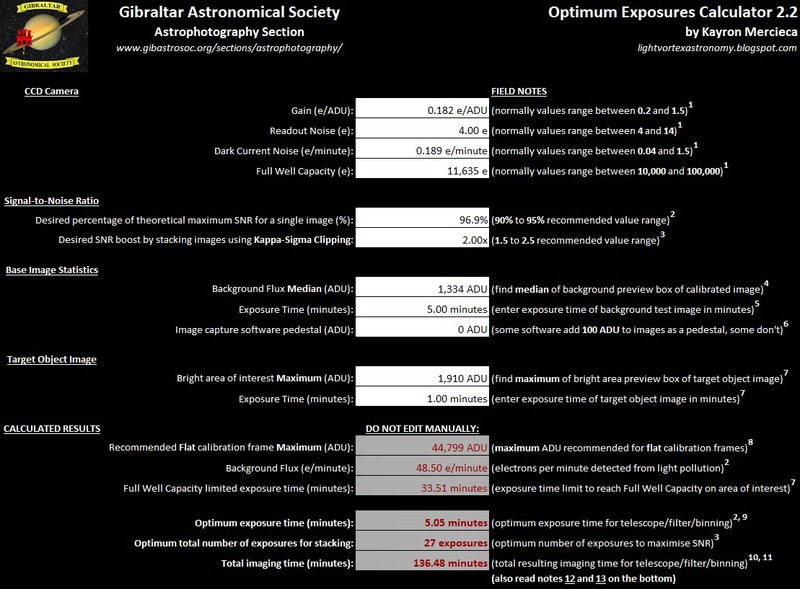 There is now an extra section on the Optimum Exposures Calculator, which essentially calculates (on the side) the maximum exposure time in minutes in order to fill the Full Well Capacity of your CCD sensor (leading to saturation). This does require that the Full Well Capacity of your CCD sensor is provided at the top. In order to determine the maximum exposure time, the user is required to measure the Maximum (ADU value) of an area of interest in a test exposure of their intended target object (e.g. the core of a galaxy or the brightest nebulosity in a nebula). 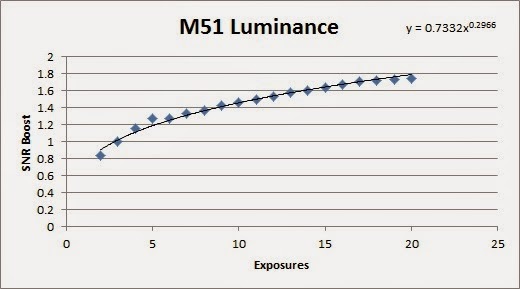 Given the Maximum (ADU value) provided and the exposure time of the test exposure, the Optimum Exposures Calculator then calculates how long it will take for the pixels there to fill up to Full Well Capacity, leading to saturation and therefore loss of detail in that region. This information can be used by the user to his/her own accord. One may wish to stick to the optimum exposure times provided, or limit them to the Full Well Capacity limit. Perhaps on limiting it, the user may wish to simply capture more exposures to stack than is recommended. 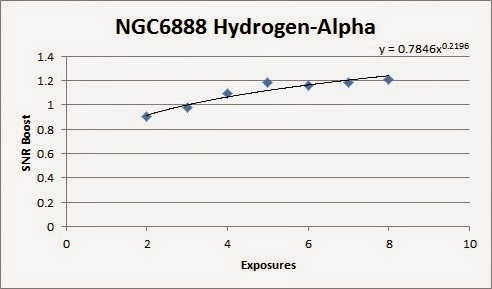 Using the first equation above, one can also estimate the SNR Boost Factor resulting from a certain number of exposures used in the stacking process with Kappa-Sigma Clipping.